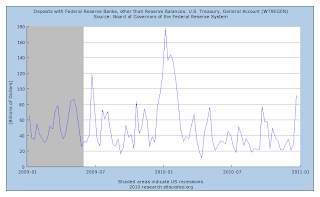 Stephen Williamson: New Monetarist Economics: What's Happening with QE2? "The general account is where tax receipts and the proceeds from new Treasury issues are deposited." Have you heard about the "Treasury and Tax and Loan Program"? A portion of tax payments (approx. 20%) remains in the banking system through "note option depositories". Any transfer from/to TT&LP would rsult in higher/lower general account balance. The TT and LP is news to me. Thanks for the information. I'd say that it's best to plot currency in circulation on a different axis than reserves since the latter overwhelms the "visual granularity" of the former. Also, it's better to chart the year over year change of currency in circulation since it changes quite slowly. Anyways, if you make such a chart you'll see that the rate of increase in currency outstanding has been expanding the last 4 months, corresponding with QE2. 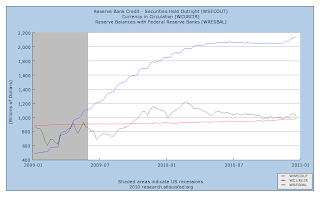 Reserves are being converted into cash at a faster rate. What does this all mean? People want to hold more cash because they expect to be buying more? Maybe prices are on the rise so they want to carry around more cash in their pockets? Yes, I've been looking at the rate of increase in currency as well. The year-over-year percentage increase has been increasing (second derivative is positive) but it's not so much above 5%. This certainly bears watching. 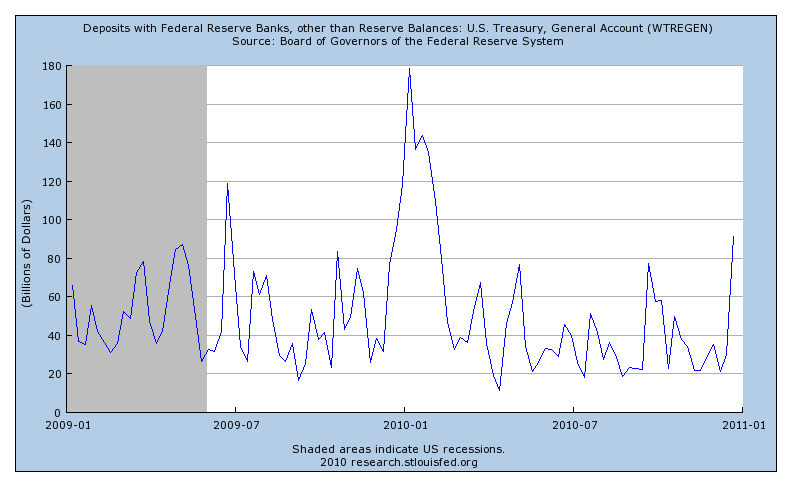 Do you think it means anything that the yearly rate of growth of cash in circulation began to pick up in late August, right when Bernanke announced the roll-over of Agency into Treasuries, and that this rate of currency growth has continued to move up with the execution of QE2 beginning in November? And that this corresponds with the rise in equity markets beginning around the same time (late Aug), and the bottom in the TIPS spread and its subsequent rise? QE1 was not marked by a significant increase in the rate of growth of cash in circulation (well, at the beginning yes, but this tapered off dramatically). People and firms seem to want to hold a larger cash balance. What do you think this signifies? Is it just noise? Could mean nothing, though I'm curious to hear what your opinion is. While the stock of currency moves in a very smooth fashion, unlike M1 and M2 for example, it's difficult or impossible to attribute particular causes to movements in the currency stock. 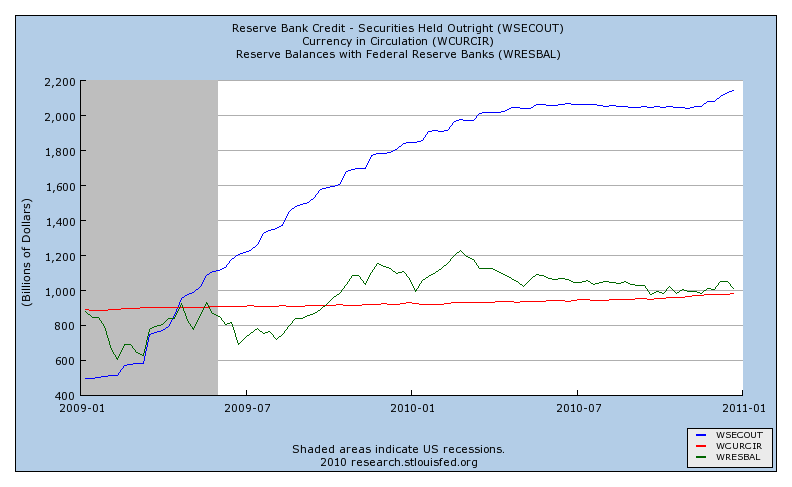 The key problem is that we can't know (though we can make some inferences) where the currency is. In the case of US currency, a lot is held overseas. As with currency in Canada and other countries, a significant fraction of domestic demand comes from its use in illegal activities, which are also hard to measure. In principle, all of the factors you mention could matter. Growth in currency has to give us some information, but you need to be careful about it. Thanks, will be careful about reading too much into the increase in cash but will continue to monitor it. The timing of it is what really pops out. And its coincidental move with other important variables like equity prices.